Tim's back in his pronunciation workshop. This time he's finding out what happens when a word ending in a consonant sound is followed by a word starting with a vowel sound. Hi. I'm Tim and this is my Pronunciation Workshop. Here, I'm going to show you how English is really spoken. Come on, let's go inside. Today, I'm going to tell you about perhaps the most common feature of fluent English pronunciation. And to help me, I’m going to use one of these. Now, I know you know what it is, but let's ask the people of London to describe it. An egg – that's two words, right? But, when we pronounce them, there's no gap in between them. It almost sounds like one word. Listen again. In fluent English, when one word ends in a consonant sound and the next word begins in a vowel sound, we link the two sounds together without a pause in between them. So, an egg becomes anegg. This is called catenation. Here are some more examples. I used to believe in Father Christmas, but not any more. I had to give up jogging. He had it in his office. Right, so you've heard the examples: you know the drill. Listen and repeat. Great work. Remember, if you want to learn more about pronunciation, then please visit our website, bbclearningenglish dot com. And that is about it from the Pronunciation Workshop for now. I'll see you soon. Bye! Now I think I’m going to have this egg, for my lunch. It is a hard-boiled egg, isn't it? 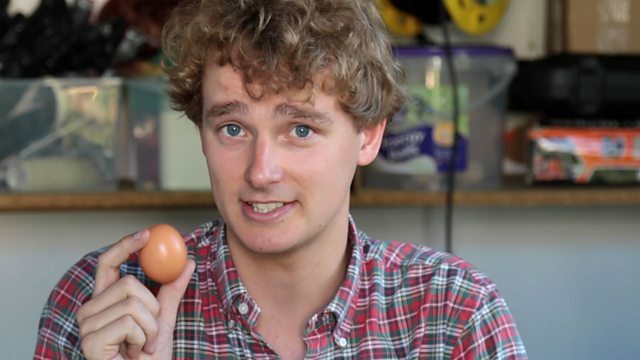 Oh yes Tim, yes, yes, it's definitely a hard-boiled egg. Great, looks good, Oh no no no no no! Ohhh, what a mess! Very funny. When one word ends in a consonant sound and the next word begins with a vowel sound, we link the two sounds together without a pause between them. The teacher gave a book to each and every student. She's learning English to get a better job. I live in a flat in the West end of town. In fluent English, when one word ends in a consonant sound and the next word begins in a vowel sound, we link the two sounds together without a pause in between them.